Global warming causes catastrophic glacial collapse in western Tibet. 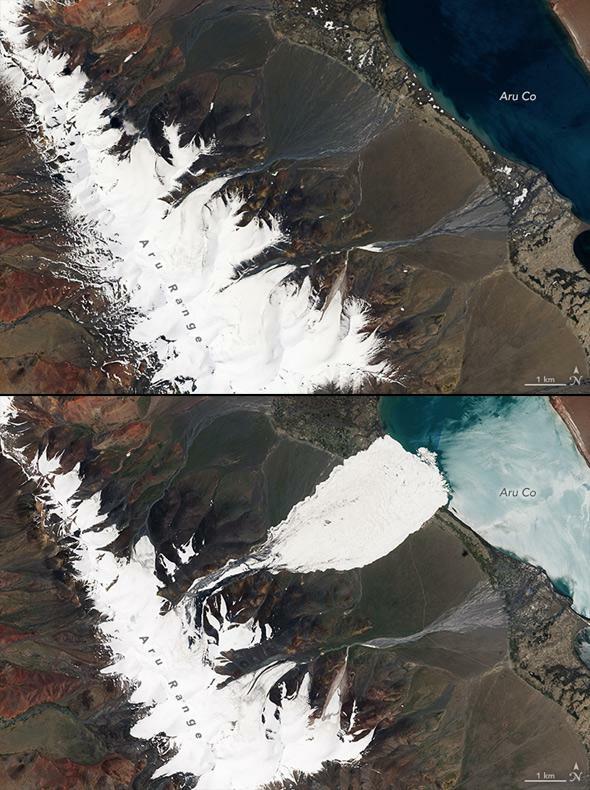 Satellite images showing the glacier before collpase (top: June 24) and after (July 21). Note the scale: The images are about 14 kilometers across. One of the reasons some people have a hard time grasping the reality of global warming and its effects is that it’s slow. Sea levels, for example, are rising at just three millimeters per year on average —your fingernails grow 10 times faster. But global warming is relentless. It continues, year after year, in many ways subtly changing our climate. We get more extreme weather, more wildfires, more ocean acidification, and, of course, rising temperatures over time. Sometimes, though, the change can be sudden. We’ve been seeing glaciers all over the world melting, and we know this is due to global warming. As they melt, these huge flowing islands of ice decrease in size. Glaciers fill valleys, flowing downhill, so when they melt they retreat, their end points moving up the valley. Like the other consequences of global warming, this usually happens slowly. 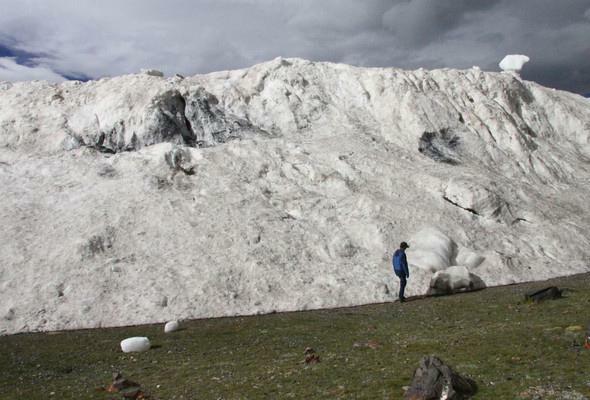 In western Tibet over the summer, however, two glaciers suddenly collapsed. Both caused avalanches, tremendous landslides of ice. While avalanches from glaciers have been known to occur, these were both very odd. For one thing, they occurred in western Tibet, which is a bit of an oddball place on Earth: Unlike most areas, glaciers there have been growing, not retreating. For another, glacial collapse in western Tibet is unprecedented. As in, this is the first time it’s ever been seen. That’s a phrase we hear a lot when it comes to global warming and climate change. One section of the avalanche terminus, where the snow and ice finally stopped. Note the person in front for scale. Scientists who studied the two collapses noted another odd thing: Aru Glacier, the first to collapse, was relatively stable in the decades before the collapse. It shrank, but not by much. Then, from September 2015 to February 2016 it actually grew by 75 meters. A lot of snow fell during that time, much more than average, adding to the mass of the glacier. This is usually called surging, but in this case that doesn’t make sense. Surging is cyclic, but the winter before the collapse was the first time the glacier increased in size by such a large amount. Moreover, the avalanche was much more rapid than would be expected, taking just four or five minutes (according to witnesses) to travel over five kilometers and cover nearly 10 square kilometers of area. Under the glacier and around it (including the area it eventually covered in the landslide) is bedrock, and usually glaciers stick to that pretty well. So this rapid flow is very odd indeed. According to the scientists, the only way this rapid flow could have happened was if there were a lot of water under the glacier to lubricate it, allowing it to move more quickly. Where did that water come from? Almost certainly it came from melting. Temperatures in that area have increased by 1.5° C in the past five decades. This would help the glacier melt, of course. Plus, remember, there was more than average precipitation in the form of snow the winter before; once warmed that would have added to the melt water, further loosening the glacier at its base. Increased temperature, more melting, weird conditions? These are the hallmarks of global warming. And remember, there has never been a collapse like this seen in western Tibet before … and then, in a single summer, we get two of them. Temperatures there were no higher than average for that time of year, but the average itself has been increasing over time. It sounds like this was an event that has been building for quite some time, and just needed to find its tipping point. That’s another hallmark of warming. While this region is remote, there are people there, and tragically nine were killed in the first collapse; 70 million cubic meters of ice and snow moving at 60 kilometers per hour is unforgiving. No one was known to have been killed in the second collapse, but there are a lot of other glaciers in that area. Aru Glacier is situated in a steep region, setting it up for catastrophe. Other glaciers in that area are also on steep slopes, and scientists are keeping an eye on them. Aru may have been the first such catastrophic collapse, but with the world warming up—including western Tibet—it almost certainly won’t be the last.